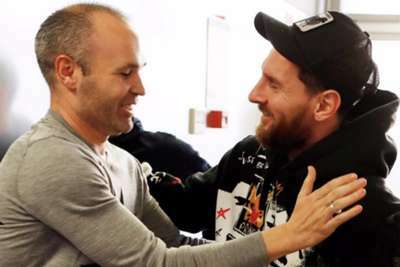 There was a reunion in Barcelona, where club great Andres Iniesta met up with Lionel Messi and his former team-mates. World Cup winner Iniesta left Barca for Japanese side Vissel Kobe in May after 16 trophy-laden seasons at Camp Nou. But the 34-year-old star paid his ex-club a visit on Monday, ahead of Barca's Champions League clash against Tottenham. Iniesta was pictured with Messi, Luis Suarez and others as he enjoys the J.League off-season.